Crystal Mountain Hotels offers three cozy hotels just steps away from Crystal Mountain. The Alpine Inn is our signature Bavarian Style Hotel that is connected to the Alpine Inn Restaurant and the legendary Snorting Elk Cellar. Set back into the trees, the Alpine Inn is just a three-minute walk to the main Crystal Mountain Resort and offers a wide variety of room types. The Village Inn is great for couples or singles looking for a getaway. The standard queen rooms have a small balcony attached, and there are a select few rooms at this location that are pet-friendly, the pet-friendly rooms feature a beautiful wooden bed frame and are on the ground floor for easy access in and out with your animal friends. The Quicksilver is great for couples or families, the queen beds are all on the ground floor, and the second floor has the larger loft-style rooms and a large lobby filled with couches, tables, and a large stone fireplace. Alpine Inn: The Alpine Inn Hotel is our signature Bavarian Style Hotel. Connected to the Alpine Inn Restaurant and the Snorting Elk Cellar and Deli, this hotel is just a three minute walk to the main resort. The rooms do not offer a t.v, mini fridge or coffee maker for that Bavarian ski lodge experience. The Alpine Inn lobby has a stone fireplace, comfortable couches, and wi-fi. Village Inn: These rooms offer a flat screen tv with a built in DVD player, small refrigerator, coffee maker, and wifi. The standard queen rooms have a small balcony with chairs for relaxing, and this building also offers a few select pet friendly rooms. The pet friendly rooms feature beautiful log furniture and are on the ground floor for easy access in and out with pets. The rooms with two twin beds are great if you are traveling with a friend and all rooms have the option for a rollaway bed for an additional fee. Quicksilver Lodge: The Quicksilver Lodge is great for both couples and families, the rooms on the ground floor have just one queen sized bed, and the rooms on the second floor are loft style (they have a queen sized bed on the ground floor, a small stairway, and two double sized beds in the loft.) The second floor of the building also has a large lobby that features a stone fireplace, with plenty of couches, tables, chairs, and an ice machine. All rooms contain a flat screen tv with a built in DVD player, small refrigerator, coffee maker, and wifi. There is a coin operated washer and dryer on the ground floor. Dining: There are three restaurants located at Crystal Mountain during the summer. The Alpine Inn Restaurant offers Bavarian-inspired food such as Hungarian Goulash and Wiener Schnitzel, along with classics like NY Steak, catch of the day, and specialty soups that change daily. During lunch service, they offer gourmet hamburgers and a delicious variety of sandwiches. The Snorting Elk Cellar offers a more casual atmosphere with more classic bar food, which pairs nicely with their specialty Elk Frost and 21 on tap brews. The Summit House is accessed by the Rainier Gondola, and typically only offers lunch for a short time each day. However, the view cannot be beat as Mt. Rainier takes up most of the scenery from this Mountain Top Restaurant. During the Winter Season, there is also the Snorting Elk Deli which offers soups, sandwiches, pizza, chili, and so much more. The Cascade Grill offers American style dining in a cafeteria setting during the daytime, and the Bullwheel offers a relaxed, sit down atmosphere with gourmet burgers and drinks. Rainier Gondola: The Mt. Rainier Gondola is located just steps away from the Alpine Inn and a five-minute walk from the Quicksilver Lodge and The Village Inn. This cable car takes you to the top of Crystal Mountain for sweeping views of the surrounding areas and the Cascade Range, and a view of Mt. Rainier that cannot be beat. Disc Golf: Crystal Mountain has not only one, but two disc golf courses. 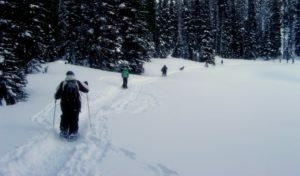 The lower course is more leisurely, walking you through the lower valley of Crystal Mountain, and the upper course which is significantly more challenging. Bring your own discs or rent some from the resort.